This was our second year at this great little festival at Kidd Springs park in Oak Cliff. I first heard about this party through the Texas BBQ Posse blog and from my little brother, who helps with the OCTX booth. 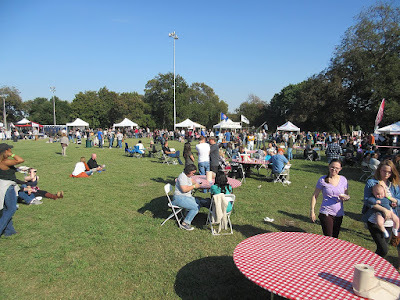 This is another very laid back, family and dog friendly event held in a small city park. For just $20 advance/$25 at the gate, you get to sample from 30 different BBQ teams and help pick the People's Choice award winner. I have had the offer to be an "official" judge before, but I found it was a lot more fun to wander around and do the people's choice sampling. Plus there was the advantage that I know whose food I am eating and will know where to find more should I want some! That's something you don't get as a blind taste test judge. This fest has a real mixed bag of cooks and food samples. They use everything from small back yard smokers to huge custom trailer jobs. 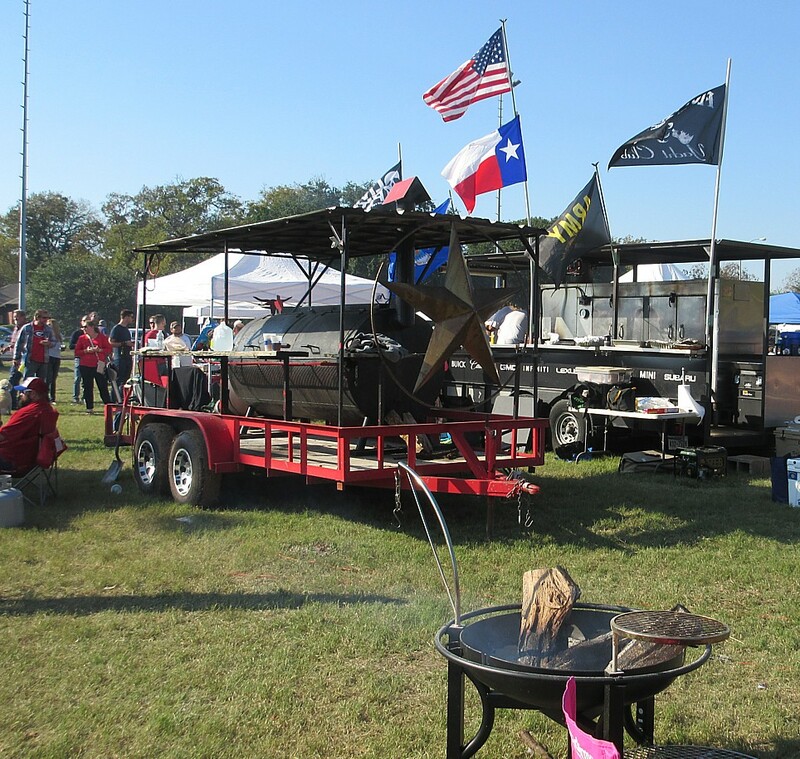 There are restaurants, back yard cooks, and well seasoned BBQ cook-off teams competing. As you might expect, the food quality is all over the place. There was a lot of pulled pork. Two of the booths had cooked whole hogs. One of them had some of the juiciest most succulent pork I have had in a long time. There was also a lot of brisket. Most was pretty average but a few were excellent. 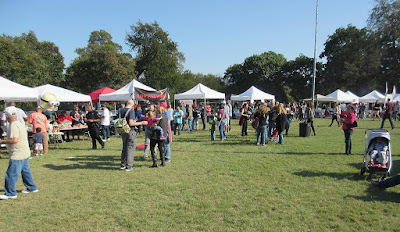 Ribs showed up at 4 or 5 different booths but unlike last year I only had one rib that was really good. 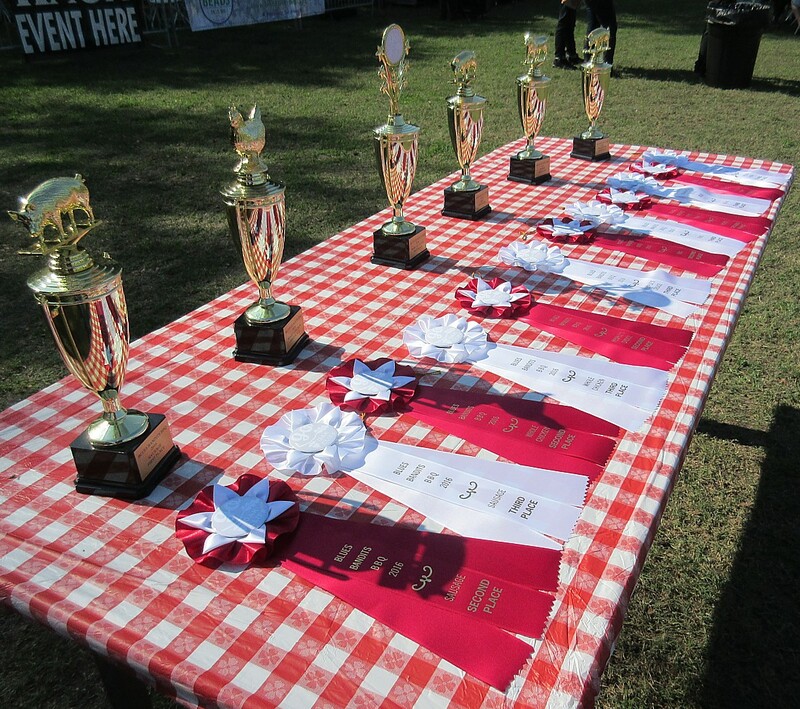 Most were tough and under cooked or depended on a heavy slathering of sauce for flavor. None had much smoke flavor. 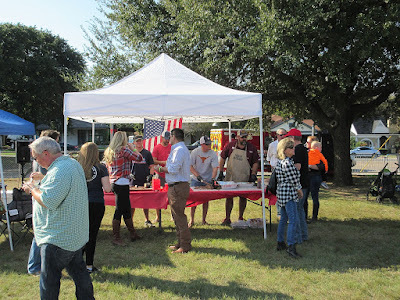 There were some of the usual "different" entries including sausage pizza, brisket jalapeno poppers, and brisket nachos. 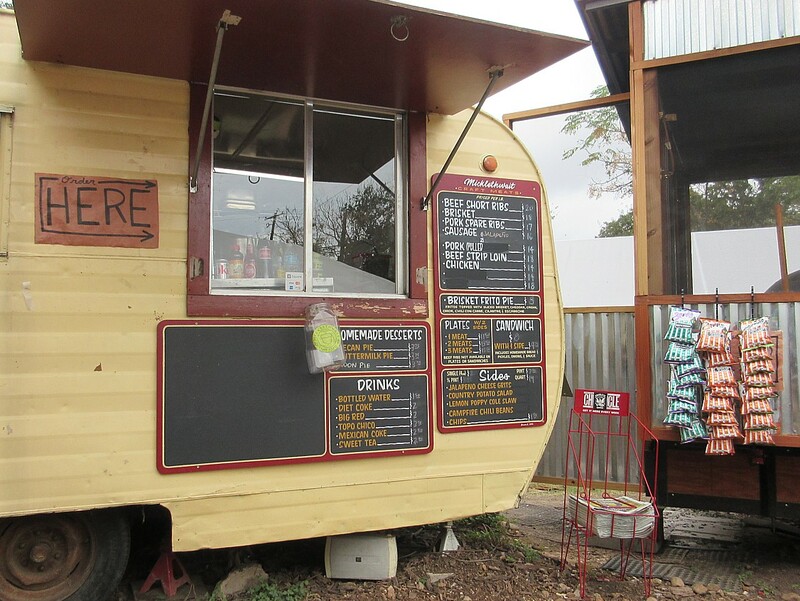 There were several pulled pork sliders and tacos. Each participant in the People's Choice tasting was given one wooden nickel to award to their favorite. 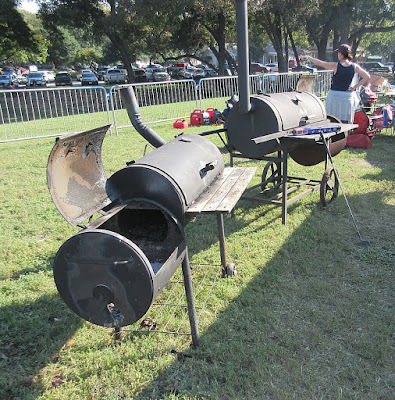 I wish I had one for ribs, brisket, pulled pork, and etc., but we got just the one. I gave mine to the team shown below for some excellent fatty brisket we had early on in the tasting. I got a second sample an hour later and it was just as good. 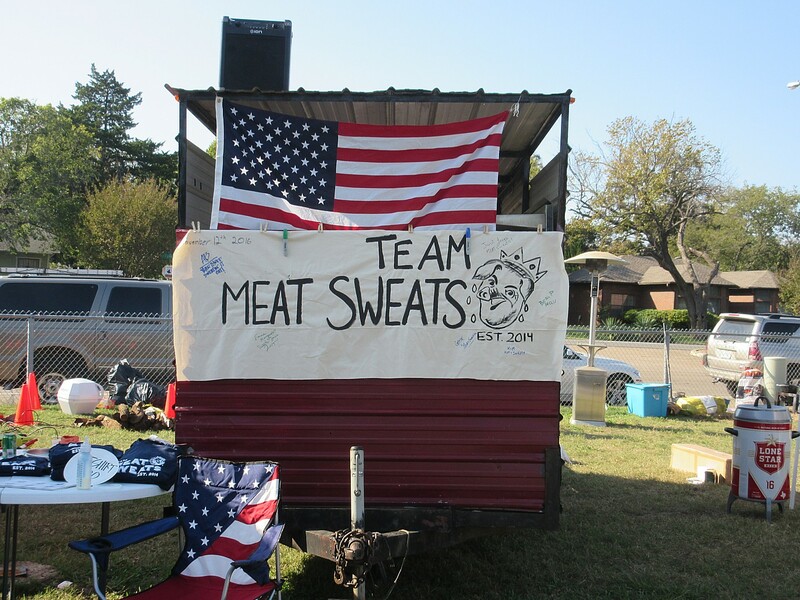 I asked the name of their team, as they had no sign or other "advertising" and it was something market. I never could quite make out the name. However here is their booth, below. My Mrs gave her token to a different booth for their excellent pulled pork and I really could not disagree with her. It was tough to pick one "winner" from so many good samples. It sure was fun trying though! 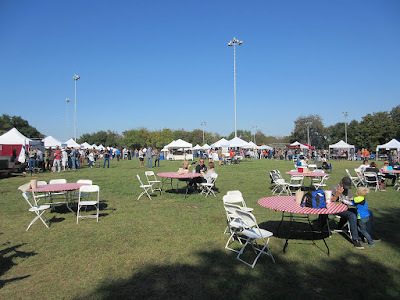 This was a fine way to spend a November afternoon with beautiful weather, good music, and some fine smoked meats. For just $20 it's one of the best bargains I have found on the whole BBQ circuit. 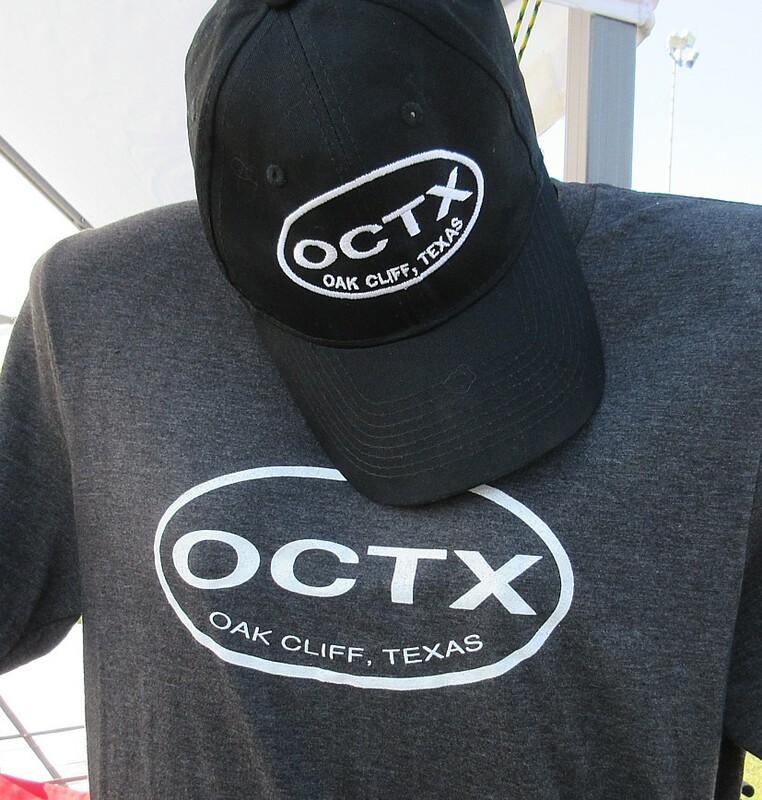 You might not find any famous pit masters hanging around but there's no long lines and it is a whole lot of fun. I have been wanting to sample this place since tasting their food at several BBQ festivals and my lucky brisket win finally gave me an excuse for a road trip to do just that. My Mrs tagged along for this adventure and we arrived at the trailer early at around 10:30. We were surprised to be the only folks waiting for their 11 am opening. However the threat of rain might have kept a few folks away. 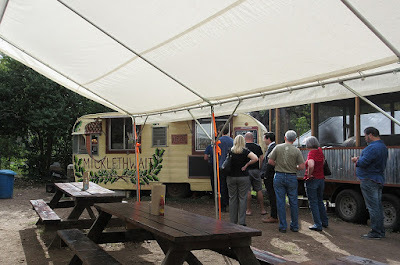 We even noticed that the line at Franklin BBQ, just down the street, was only about 100 people as we drove past. The threat became real a bit later as a pretty good downpour hit the area before we finished our meal. As the 11 am hour approached a few more folks showed up and I think there were about 5 of us in line when the window finally opened. 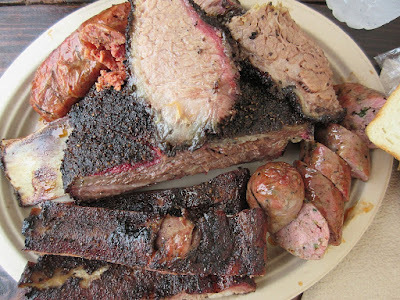 I ordered a half pound of brisket from the fatty end, 3 pork ribs, a whole beef rib, a hot link, and a jalapeno sausage link. Here's the plate full of happiness that arrived after a few minutes. More folks trickled by for the next hour but the line never got to be more than 6 or 8 people long. The brisket burnt end was tender, moist, and amazing. Smoke flavor was deep and the fat melted in my mouth. There was just a tiny bit of crunch from the bark. 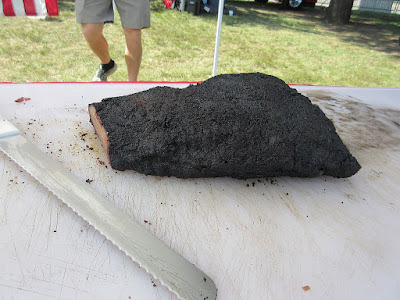 The other two brisket slices were just as nice. 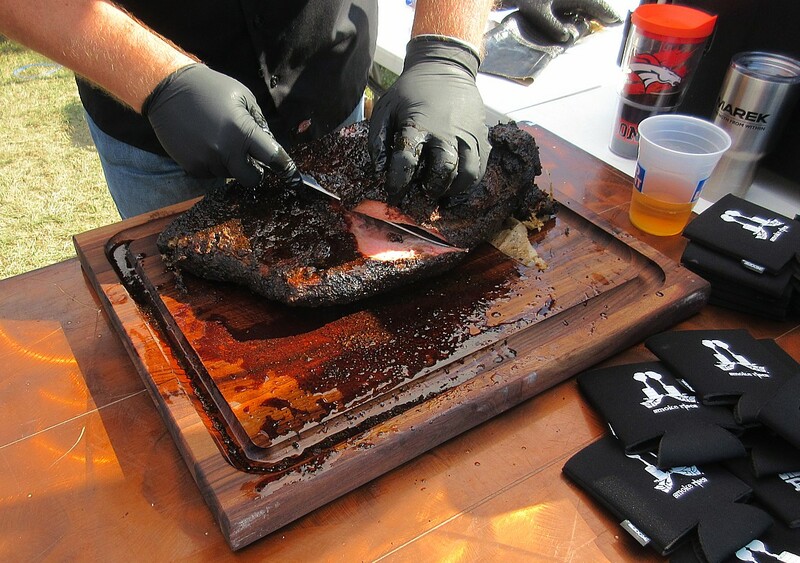 That's the reward for getting the first slices of the first brisket of the day. 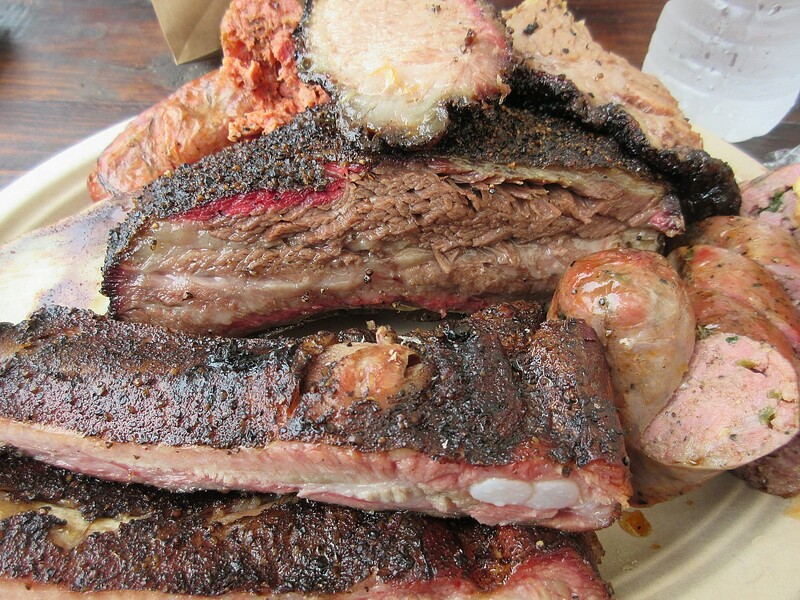 The beef rib fell into the same category. While they don't have the sweet sauce finish Pecan Lodge has, this was a mighty fine beef rib. 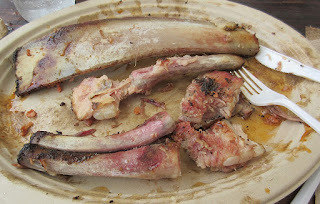 Every bite was tender, moist, and flavorful, with just a bit of crunchy bark. The pork ribs pulled away from the bone just a bit too easily but had great flavor, moisture, and tenderness. The hot link and jalapeno sausage were both a beefy coarse ground variety with different spice mixes. I loved them both. 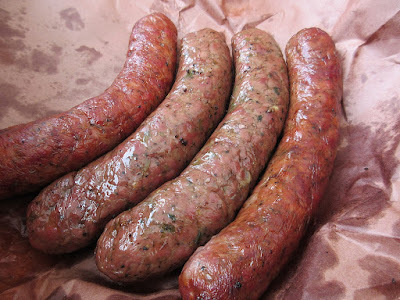 I'm not ready to say they have surpassed Kreuz jalapeno cheddar as my new favorite sausage, but, dang, they were right up there. I dug those sausages so much I got a couple of extra of each to take home in the cooler. 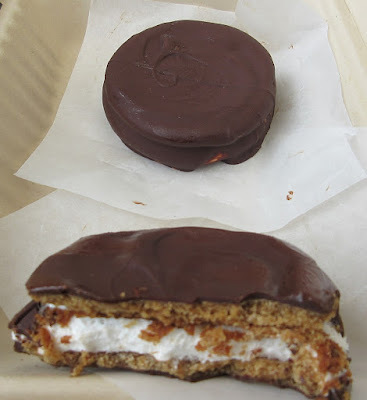 We also sampled the home made moon pies and they got a huge thumbs up, too. Overall this was an outstanding meal and alone would have been worth a 400 mile round trip. 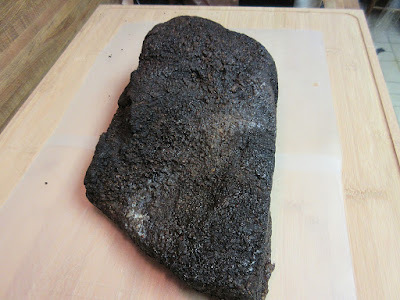 However I also got a whole brisket out of the deal! Life is good. 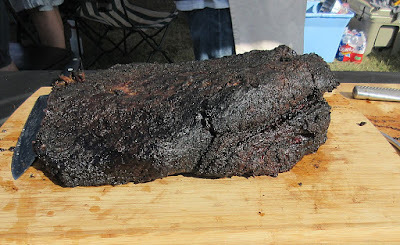 Then my buddy Dave showed up with a whole Franklin brisket so we went home with two whole briskets. Life is very, very good! 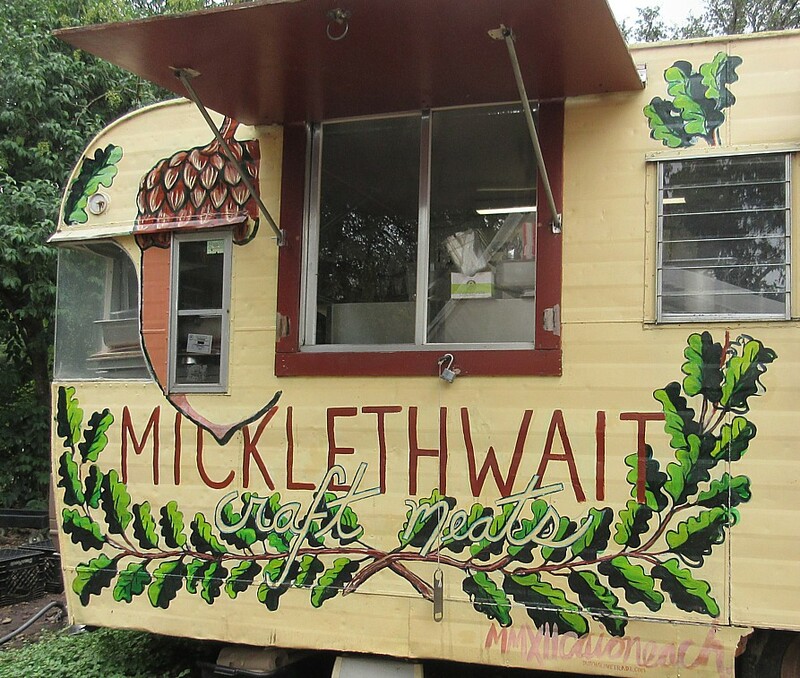 I will go out on a limb and predict right now that Micklethwait Craft Meats will make the new Texas Monthly top 50 due out next summer. It's not much of a limb, based on what we ate today. Sometimes it pays to be lucky rather than good. The photo above proves it can happen! That's me with a FREE whole smoked brisket from Micklethwait Craft Meats in Austin, courtesy of MCM and the Man Up Texas BBQ Blog. Here's the story. Back on October 18th, Drew and the guys at Man Up had one of their occasional game day giveaway contests. 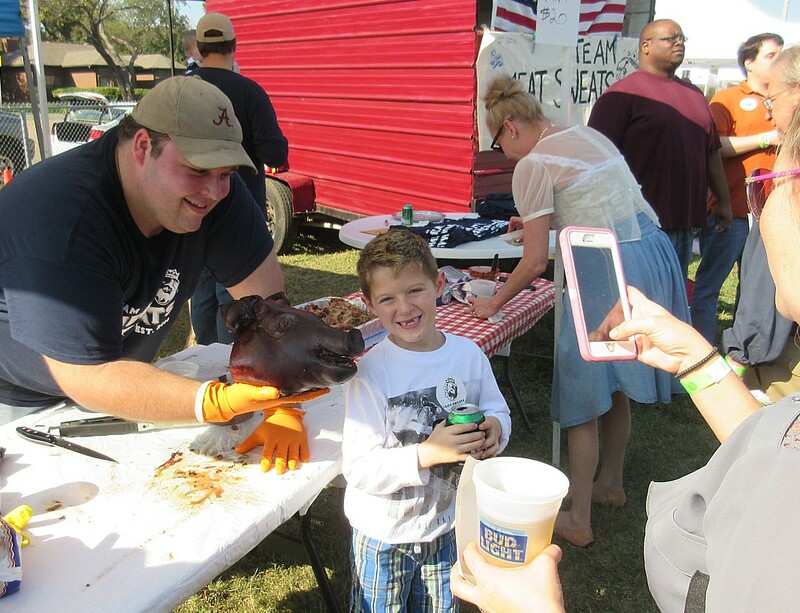 Whoever could guess the closest to the final score for the Alabama/Texas A&M football match up would be the winner. Now there are few people in the USA (and certainly in Texas) who know less about college football than me. I could not name a single college football coach or player if my life depended on it. I don't follow or watch college football, at all. However the prize on this occasion was a whole smoked brisket from Micklethwait. I had sampled their brisket and sausage a few times before at various BBQ festivals and always found their food to be excellent. 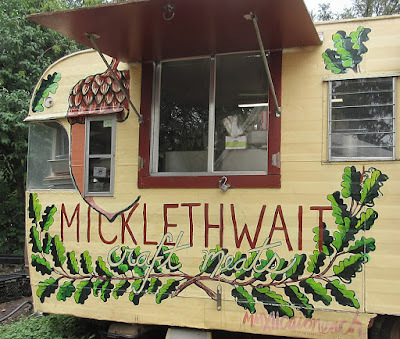 They have gotten great reviews by other bloggers and they were also on the short list for spots Scott and I need to sample at their home base. It didn't cost me anything to try and that was an awesome prize, so why not? Being of a scientific mind, I looked at the scores of the two teams against other opponents this year and used that to just guess at the outcome. My guess of Alabama 34/TAMU17 was closest to the actual score of Alabama 33/TAMU 14. I want to thank both of those teams for cooperating in this endeavor! 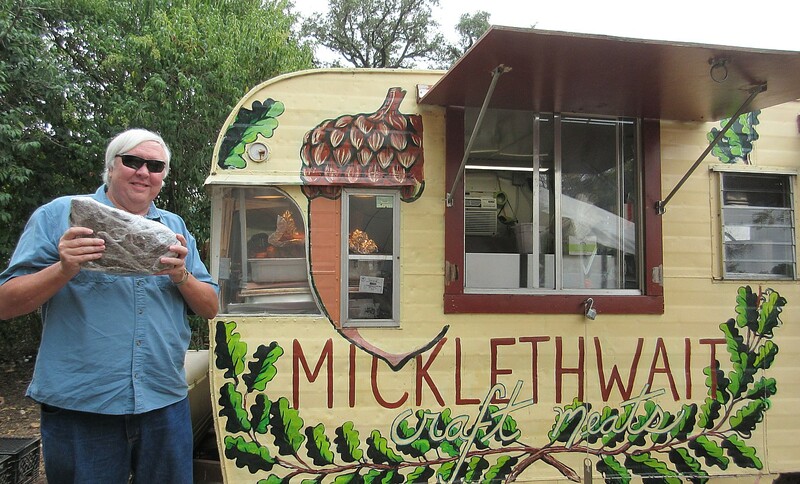 Drew e-mailed me the next day to let me know about my dumb luck and soon after the fine folks at Micklethwait contacted me about picking up my prize. 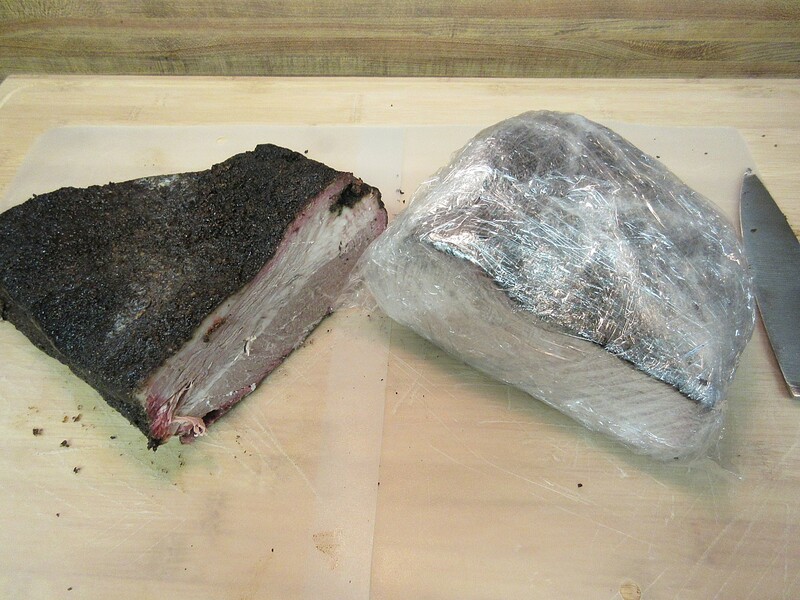 I arranged a pick up on November 3 and they had a beautiful 7 pound brisket wrapped and pre-chilled for me to bring back in the cooler. 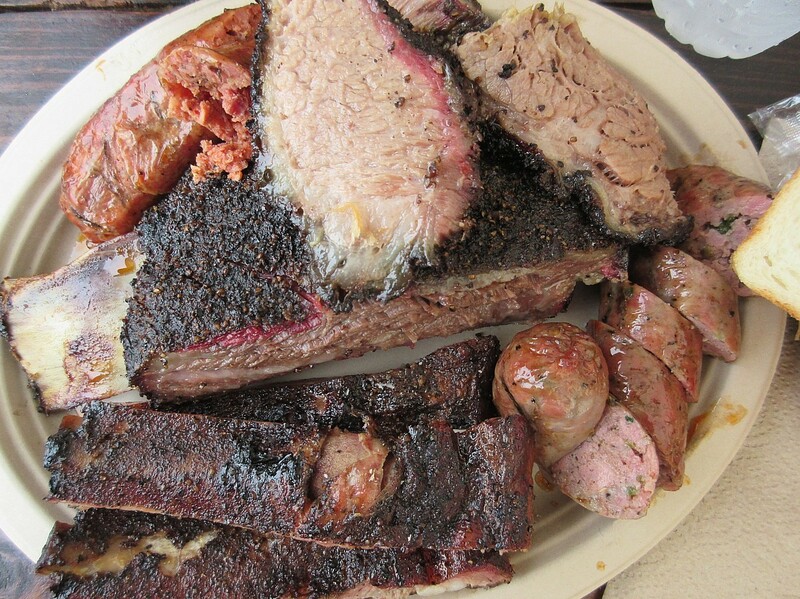 However, since I was there, I also bought a full lunch to sample all the meats on the menu. I was not disappointed, but that story will be in a separate post. I separated the point from the flat and froze the point for eating later. I'll be feasting on the flat this week. Thanks again to Drew and the team at MCM for giving me an excuse for a great road trip and some delicious eating ahead.